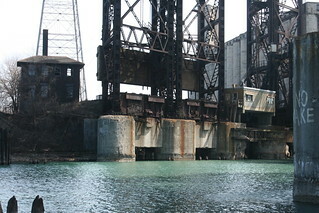 Two of the three surviving vertical lift bridges next to the Chicago Skyway are abandoned, permanently raised and with their tracks removed. A fourth bridge once stood where the control house is - why that one was removed, while the other three remain, is a mystery. The Calumet River at the base of the abandoned bridges is strangely serene.